Throughout its history, jazz has constantly evolved, developing from and reacting against its earlier incarnations. The mid-1940s saw bebop reinvent jazz as an artist's genre, distinct from the swing style that was the popular music throughout the 1930s and '40s. Bebop was music for listening, not dancing, and the emphasis became virtuosic improvised solos instead of memorable tunes and arrangements. However, the advent of bebop itself led to further reactions and developments within jazz during the 1950s. The newer genre again divided; cool jazz became a reaction against bebop, while hard bop maintained much of the bebop aesthetic. Hard bop players continued in the bebop idiom by emphasizing improvisation, swinging rhythms, and an aggressive, driving rhythm section. Hard bop artists retained bebop's standard song forms of 12-bar blues and 32-bar forms as well as the preference for small combos consisting of a rhythm section plus one or two horns. One of the premier hard bop artists and, in fact, the one who coined the term with the 1956 album Hard Bop, is drummer and bandleader Art Blakey. His band, the Jazz Messengers, was an extremely talented and influential group from its conception. Blakey formed the Jazz Messengers in 1953 with pianist Horace Silver, but, with the group's personnel constantly changing, few artists spent an extended period. This frequent turnover resulted in Blakey consistently working with the talented youth on the jazz scene. His band served as a developmental stage for future bandleaders including Hank Mobley, Kenny Dorham, Freddie Hubbard, Lee Morgan, Chuck Mangione, Jackie McLean, Wayne Shorter, Cedar Walton, Wynton Marsalis, Benny Golson, and Bobby Timmons. On October 30, 1958 Art Blakey and the Jazz Messengers recorded the album Moanin' at Van Gelder Studio in New Jersey for the Blue Note label. Moanin' is one of the most influential and important hard bop albums due to its outstanding compositions, arrangements, and personnel. The quintet at this time consisted of Pittsburgh native Art Blakey on drums, trumpeter Lee Morgan, tenor saxophonist Benny Golson, bassist Jymie Merritt, and pianist Bobby Timmons, all from Philadelphia. Benny Golson wrote the arrangements and contributed four of the album's six tracks. The title track, "Moanin,'" composed by pianist Bobby Timmons, became the greatest hit of Blakey's lengthy career. Despite being only twenty years old at the time of the recording, Lee Morgan had already spent two years touring with Dizzy Gillespie's band. His improvisational contributions are indispensable to the sound of the album. Morgan and Benny Golson carry the melodic and solo responsibilities as the only horns in the band. Clifford Brown strongly influenced Morgan's style, characterized by an aggressive rhythmic attack, long melodic phrases, and a brassy timbre. Golson performed with artists such as Tadd Dameron, Lionel Hampton, and Johnny Hodges before joining the Dizzy Gillespie band on a tour of South America from 1956-58, the same years Morgan played for Gillespie. Golson's tunes "Are You Real?," "Along Came Betty," "The Drum Thunder Suite," and "Blues March" lend a notable variety and versatility to Moanin', utilizing varied song forms and musical styles. As an improviser, Golson's smooth tone and fluid lines contrast with and complement the aggressive playing of Lee Morgan. Morgan and Golson provide a solid frontline, but the Jazz Messengers rhythm section drives the band and propels the soloists to ever higher levels. Pianist Bobby Timmons, a jazz veteran who played with Kenny Dorham's Jazz Prophets, Chet Baker, Sonny Stitt, and Maynard Ferguson, composed the title track and consistently makes his presence felt through his tasteful comping and solos. Duke Ellington's bassist Jimmy Blanton especially inspired the Jazz Messenger's Jymie Merritt, though he studied formally with a member of the Philadelphia Symphony at the Ornstein Music School. His first gigs were with Tadd Dameron, Benny Golson, John Coltrane, Philly Joe Jones, and, from 1955- 57, he toured with blues artist B.B. King, Merritt provides the bass lines and rhythmic punctuation depending on the style of the song and is featured as a soloist several times throughout the album. 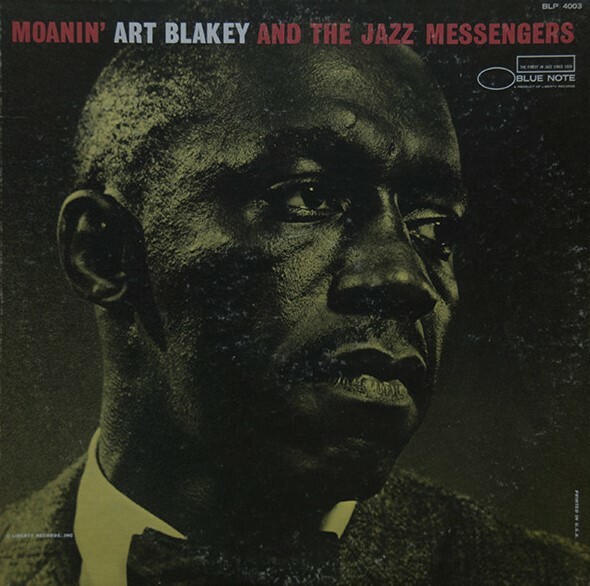 Drummer and bandleader Art Blakey provides the aggressive, driving pulse that propels the Jazz Messengers and is so characteristic of the hard bop style. Blakey was 39 at the time of this recording, the Jazz Messengers had already progressed through several lineups, and Blakey remained the only constant. Despite the changing personnel, the Jazz Messengers remained the archetypal hard bop group, characterized by an emphasis on the blues roots of the music. Blakey is notable for his aggressive drumming, use of polyrhythm, musical interactions with his soloists, and his personality. Blakey felt strongly that jazz was underappreciated in America and he sought to bring it to a broader audience. As a bandleader, he provided his musicians with ample space for solos and encouraged them to contribute compositions and arrangements. He constantly added new talent to his band and made no effort to prevent musicians from leaving the Jazz Messengers. This combination of Pennsylvania born musicians collaborated to record one of the milestones of hard bop. The track listing includes Bobby Timmons' "Moanin';" Benny Golson's "Are You Real?," "Along Came Betty," "The Drum Thunder Suite," and "Blues March;" and a single standard, Arlen and Mercer's "Come Rain or Come Shine." The selection of songs for Moanin' demonstrates the variety of styles in which the Jazz Messengers comfortably performed. The album features aspects of blues, funky jazz, Latin-American music, and New Orleans style marching bands. The song "Moanin'" is one of the tunes that helped to generate the "soul jazz" style of the late '50s and early '60s. Influenced by gospel, "Moanin'" makes use of call-and-response technique between the piano and horns. Instead of a walking bass, Merritt plays a rhythmically driving bass line, while Blakey plays a swing rhythm with emphasis on beats two and four. Morgan, Golson, and Timmons all play two-chorus solos followed by one chorus by Jymie Merritt. Morgan's solo makes use of blues inflections and maintains its cohesion through the use of catchy riffs. Golson proceeds into his solo from the end of Morgan's and uses a similar riff-based approach. Timmons continues in a bluesy style, alternating piano runs with chords, and progressing to develop upon a series of formulaic riffs. "Moanin'" concludes with the return of the head and a short piano tag. This song is a prime example of funky or soul jazz. Benny Golson's "Drum Thunder Suite" was composed to satisfy Blakey's desire to record a song using mallets extensively. The suite consists of three contrasting themes. The first theme, "Drum Thunder," is primarily a drum solo with horns playing short melodic ideas in unison (soli writing). The second theme, "Cry a Blue Tear," utilizes a strongly Latin rhythm in the drums. It features a lyrical melody with trumpet and saxophone playing complementary lines. The final theme, "Harlem's Disciples," begins with a funky melody, and then a piano solo sets the stage for the concluding drum solo. "The Drum Thunder Suite" makes interesting use of different stylistic approaches and arranging techniques. "Blues March," also composed by Benny Golson, is intended to invoke the spirit of a marching band, with the drums clearly marking all four beats of the measure. The rhythm section is minimally invasive in this tune, and all of the listener's attention is drawn to the soloist. Morgan and Golson play typically bluesy choruses, though Bobby Timmons' solo is the highlight of the track. His solo begins with a simple line, developing into an exciting, chordal conclusion. Golson's "Are You Real?" is a more straightforward hard bop tune featuring a 32-bar chorus and a faster tempo. The standard "Come Rain or Come Shine" is performed with the attention to melody and arrangement not typically associated with hard bop, but is convincingly and faithfully represented by the Jazz Messengers. Moanin' is one of hard bop's seminal albums due to the extremely high quality of the personnel and compositions featured. The mastery with which Lee Morgan and Benny Golson provide the frontline is further elevated by the solidarity of Timmons, Merritt, and Blakey. It is a testament to the great quality of the performers, compositions, and the hard bop genre. The accessibility of the album is surely a result of Art Blakey's desire to promote jazz as an art at a time when public interest in the music was waning, and the genre as a whole was threatened by the popularity of emerging musical styles such as doo-wop and rock and roll.